You can even make the dressing if you prefer. Google should help us with that. I preferred to use the one from store as it is manufactured by Olive Garden and tastes just the same as in restaurant. It is sold in Olive Garden restaurant, but a bit expensive. Since last year, it was available for purchase in Sam’s Club. But recently it is sold in Walmart also. Not sure if it is available in local grocery stores. Mix the entire packet of the salad, olives, pepperoncini, tomato slices, red onion slices, croutons, and grated Parmesan cheese. I added about a cup of dressing right before serving. 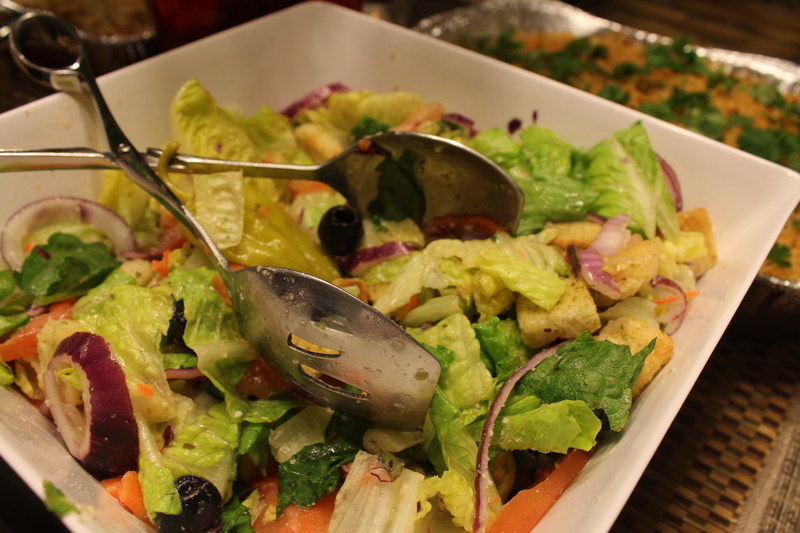 Give it a good mix and voila, here is the Olive Garden salad in your kitchen! Leave the comments below and let me know how yours turned out. 2nd time this week I saw pepperoncinis being used. Is that the ingredient of the week? They dont carry those in my supermarket…is it a chilli? is it a pepper? what’s the taste? hmm.. not sure if it is the ingredient of the week. I got mine from Walmart. Check out the pickles section, they are sold in the packaged jars. If you like bitter and spicy taste, then you will like Peperoncini. Sweeter and less spicy greek varieties are also available. Peperoncini goes well in salads and sandwiches.